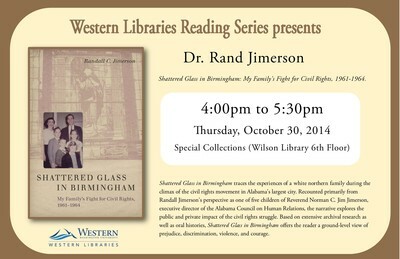 A discussion and readings by Randall Jimerson on his book "Shattered Glass in Birmingham : My Family's Fight for Civil Rights, 1961-1964". Rand Jimerson is a professor in the WWU History Department. His teaching and research areas are Archival Administration and Information Management. This resource is provided for educational purposes only and may be subject to U.S. and international copyright laws. For more information about rights or obtaining copies of this resource, please contact Special Collections, Heritage Resources, Western Libraries. This content cannot be loaded. Your browser does not support iframes.